There is a very exciting new development in the world of quilling. 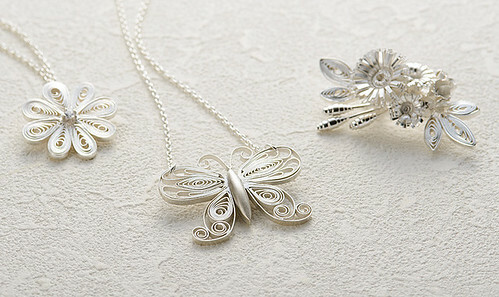 For those who prefer jewelry made of a more durable material than paper or who just appreciate the beauty of natural silver, a Japanese manufacturer of silver paper clay products, Aida Chemical Industries Ltd., recently introduced its Art Clay Silver Paper Type Long to the U.S. market. Imagine making pretty pieces like these using traditional quilling techniques! The strips have the weight of thin metal and are bendable and foldable, just like paper. They can be easily cut with a craft knife, scissors, or punch. Art Clay Silver Paper Type Long must be fired in a room temperature, temperature controllable electric kiln; air drying is not recommended. The jewelry will be 99.96% pure silver after firing, and can then be reshaped slightly and burnished to a fine shine. Motoko (Maggie) Nakatani, a quiller whose name who may be familiar to you as she is a frequent winner of quilling competitions (and the person who introduced me to my favorite quilling tool), worked with the company to develop a Silver Quilling Certification Program. 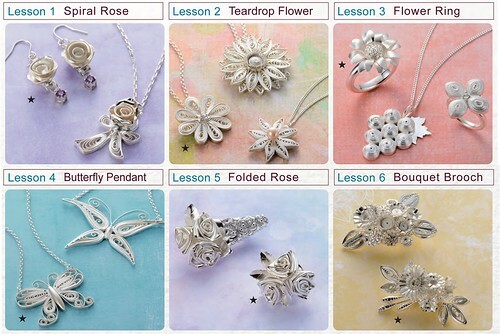 Maggie designed and created all of the lovely examples you see here and has been training Silver Quilling overseas personnel in Japan this past year. Silver Paper Long Type was introduced at the North American Quilling Guild Convention this past spring by Jackie Truty and Katie Baum, representatives for the manufacturer's USA distributor, Art Clay World. In November, they will lead a 4-day certification course in Chicago. 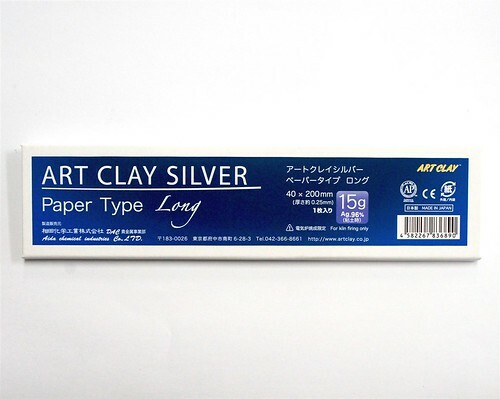 For those who already know how to quill and don't intend to become certified, Silver Paper Long Type and appropriate firing kilns can be purchased directly from Art Clay World. You'll find more information about Art Clay and answers to frequently asked questions on the company's website. Find Art Clay distributors worldwide. You might also be interested in reading about a traditional silver filigree artisan. Oh, dear! My mouth is watering. When I read the FAQ's, I saw that there is practically no waste with this. Amazing. I know what you mean, Traci! I'd love to give it a try. This is so so so cool!!! Definitely something I want to try out sometime in the future! Oh my! 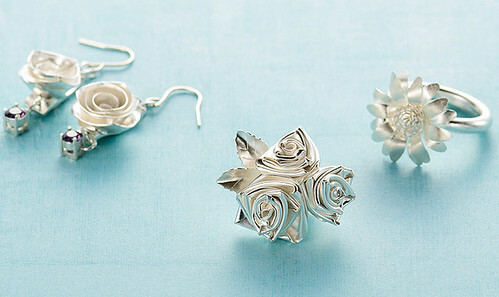 Silver, paper, and jewellery, what a great combination!! It's really fun to work with. And the results are stunning! Been to Japan and took the classes of Maggie. She a wonderful teacher. In september 2016 we'll ben teaching the course in Holland. Sorry! See that my phone selects it's own grammar. Hope you all understand what a meant to write. This is WAY overdue! This is amazing stuff and I'm putting silver paper clay on my list! Thanks for bringing this to us, Ann! Happy to read your enthusiastic comments, everyone! Henriette, thanks for letting us know about the upcoming course in Holland.